Sarah Frances Douglas was my great-great-grandmother. She went by Sallie most of the time. 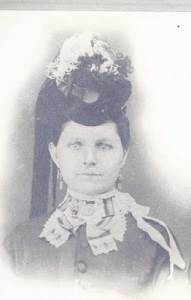 She was the daughter of William and Johannah Douglas born in Grant County, Kentucky in 1853. I know that she had at least one brother, William Douglas born in 1849 also in Kentucky, but to this date, I have found no other siblings. The 1860 Census shows that she was 7 years old living with her family in Grant County, Kentucky. Ten years later in 1870, she was living with the Lamon family in Williamstown, Lewis, Missouri. It is not clear if she was related to this family or not, she was attending school in Lewis County. On January 26, 1873, in Clark County, Missouri she married Simon Nichols, my great-great-grandfather. Sallie was wife number three for Simon. On August 14, 1873, in Williamstown, they had her first child, Lorena "Rennie", in 1876, they had their second daughter Lilly F, and 1878 Gertrude Wilburn (my great-grandmother) was born. In 1880, they were living in Union, Missouri and that is where Addie was born and died as an infant. My mother told me that her mother Gertrude was deeply saddened over Addie's death and it bothered her for years. It is not known what Addie died from but she is also buried in the Nichols Family Graveyard. In 1882 Robert Lee was born and in June 1884. Sallie and Simon's last child was born June 7, 1884, Simon Leonard Nichols. The sad fact was that Simon died on May 26, 1884, in Williamstown without even knowing his son that carried on his name. Simon Nichols was buried in the Nichols Family Graveyard on his property at the time in Williamstown, Lewis, Missouri. Sallie was now left with many children to raise by herself as well as taking care of the farm property they lived on. She married a second time to Henrich (Henry) Miller on April 9, 1888, in Clark County, Missouri. She and Henry had a son, William Henry Miller born on January 22, 1890. Sarah Frances Douglas Nichols Miller died of Heart Disease in Jackson County, Missouri on October 15, 1896, she was only forty-three years old. 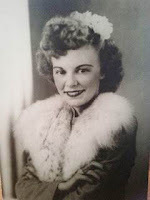 It is not known where she is buried, but I will update this post if I discover any more information on her burial. I have started up my blog again to add new information on various relatives that I have discovered over the last year or so. If you like this post please spread the word to other relatives and friends. Thank you and enjoy the post.